This is a perfect snack to serve to your guests or just for yourself. I simply love them and they aree soo easy to make. The tamarind chutney will this is also easy to make and can be refrigerated for months! Mine has been lying in the fridge for about 4 months and tastes as awesome as the first day itself. Put the drained mung dal lentils in the blender with a few tablespoons of water and grind it into a paste with the ginger, green chilli. Make it into a smooth thick paste . Add some salt and leave it to ferment for a few hours at room temperature. Chop some coriander leaves and add to it with the cumin seeds. Heat the oil for deep frying and when hot put teaspoon fulls of the batter into the oil and deep fry till golden brown and crispy. if the oil is too cold the vadas will sink and rise gradually and then soak in a lot of oil. soak some tamarind pulp in warm water for a couple of hours. Use a strainer to strain it and squeeze out all the pulp with your hands. Put a little water and resoak the pulp and repeat. Put the pulp to boil with a lot of sugar and salt and some chilli powder if you wish. Boil it for ten minutes. Cool and add chaat masala to it. You can now store this in your fridge for months. It should be fairly sweet and sour so do be generous with the sugar. You can also buy ready made tamarind chutney. Lentils are high in fiber and protein, and low in fat. Eating lentils and other foods that are rich in soluble dietary fiber can help decrease high cholesterol. The Cleveland Clinic advises eating 20 grams to 30 grams of fiber daily and eating lentils and other legumes at least three times a week. 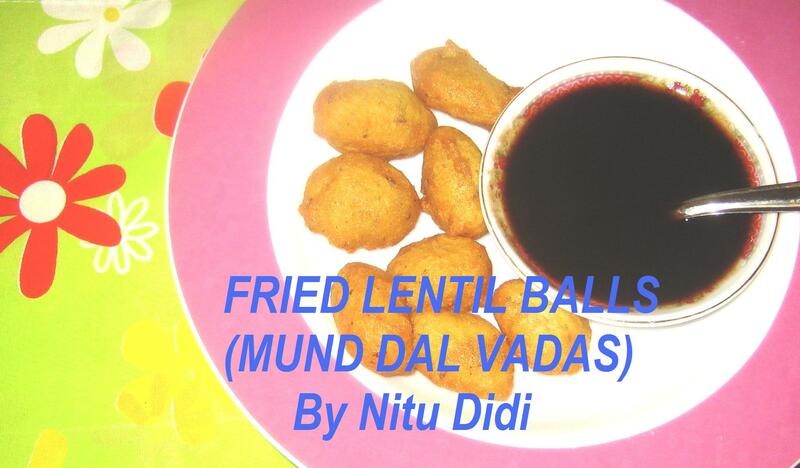 This entry was posted in Everything Vegetarian, Fusion, Gluten Free, Healthy Options, Indian Restaurant Dishes, Jain recipes, Low Cost, Magic Bullet, Nitu´s Spicy Delights, Recipes with videos, Sauces and Chutneys, Veg Starters, Vegan and tagged dal, jain, kachoris, lentils, snack, tamarind, vadas, Vegan, vegetarian. Bookmark the permalink. Otra modo de comer lentejas y que ricas!. Aunque sea sin tamarindo, que aquí es difícil de encontrar. Reme…hola guapa..esa receta vale la pena… claro sin tamarindo..con ketchup tambien esta rico! !